These two Sweethearts have appeared on our blog not once but twice before! 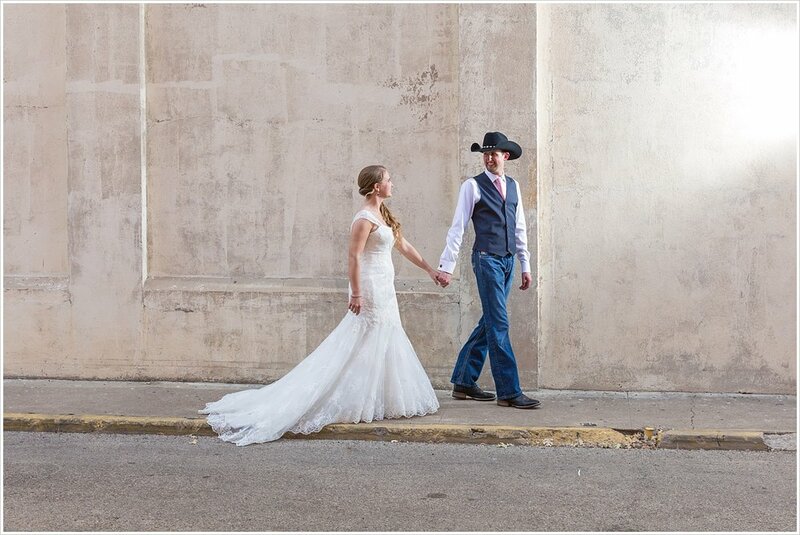 We’ve known Brian and Kendra through working with them as fellow wedding vendors in the Waco area. Brian is the talented DJ behind Broken Spoke Entertainment and we always love when we find out he’s the DJ for one of our weddings. When Brian and Kendra began planning their own wedding we were so honored they asked us to be their photographers. But we had no idea how fun it would be having them as J&M Sweethearts! First, we had an epic engagement session on a legit NASCAR racetrack. Then we had a SECOND engagement session on Brian’s grandmother’s farm in West, Texas. And that’s only the photo sessions! Learning about NASCAR, eating Olive Garden together, visiting each other’s booths at bridal shows, and just getting to know them as friends has been an amazing experience. Brian and Kendra were married at the end of July in Kendra's home state of Ohio where her family still lives. But they knew not everyone could make the trek to Ohio, so they decided to have a second celebration here in Texas. And the idea of a Texas reception was born! 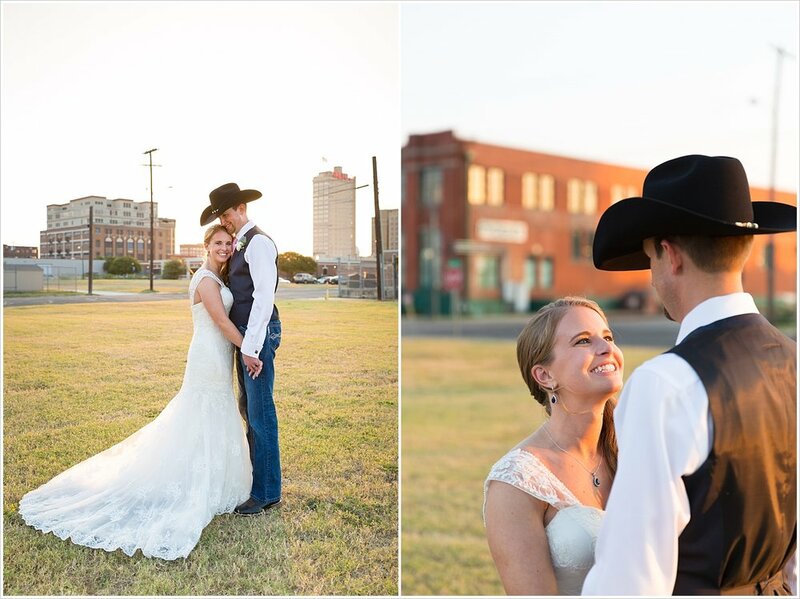 We were blown away with how authentic and fun Brian and Kendra made their Texas reception. This wasn’t just a party to celebrate their Ohio wedding. This was a real-life wedding reception! Kendra had her hair and makeup done, and put back on her wedding dress. (Yay for getting to wear your dress multiple times!) Brian didn’t wear a full-blown tux this go round, but dressed up his jeans and boots with a vest, tie and his signature cowboy hat. They had the majority of their bridal party present, with her bridesmaids even wearing their navy bridesmaid dresses again! 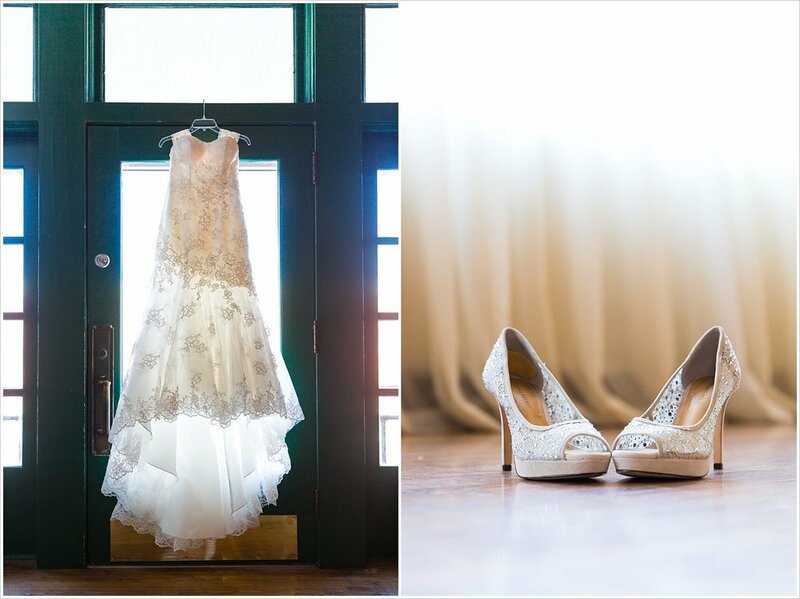 Brian and Kendra invited all their guests to The Phoenix Ballroom, a beautiful warehouse-style venue in downtown Waco. Guests arrived and sat around tables filled with centerpieces overflowing with white hydrangeas and blush & white roses. 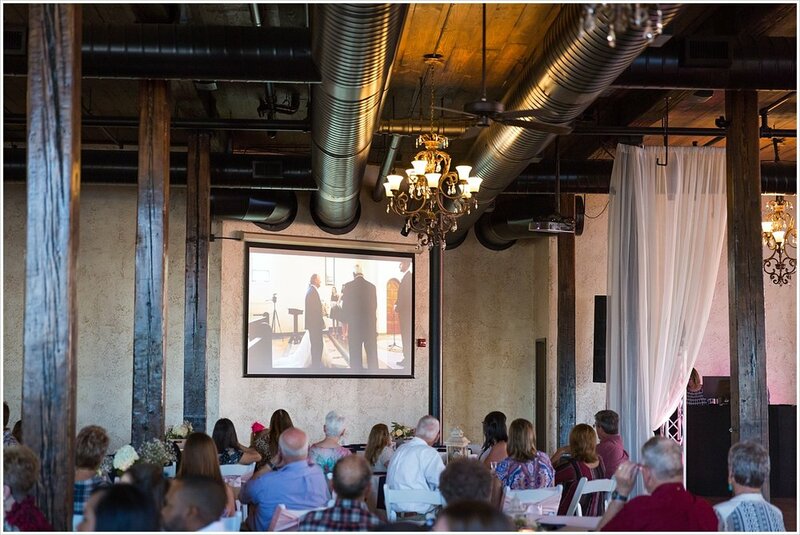 And at 6 pm, DJ Jim Alvarado called everyone’s attention to the video screens around the venue where Brian & Kendra’s Ohio wedding day video began playing. Everyone was able to see Kendra walk down the aisle on her dad’s arm, hear the vows Brian & Kendra exchanged, and see them seal their marriage with a kiss. And then as the happy couple walked up the aisle as husband and wife on screen, the video faded out and Jim announced the married couple as Brian & Kendra made their grand entrance into The Phoenix. Everyone cheered for the newlyweds, and the Texas Reception was underway. A dinner of fried chicken and BBQ was served. 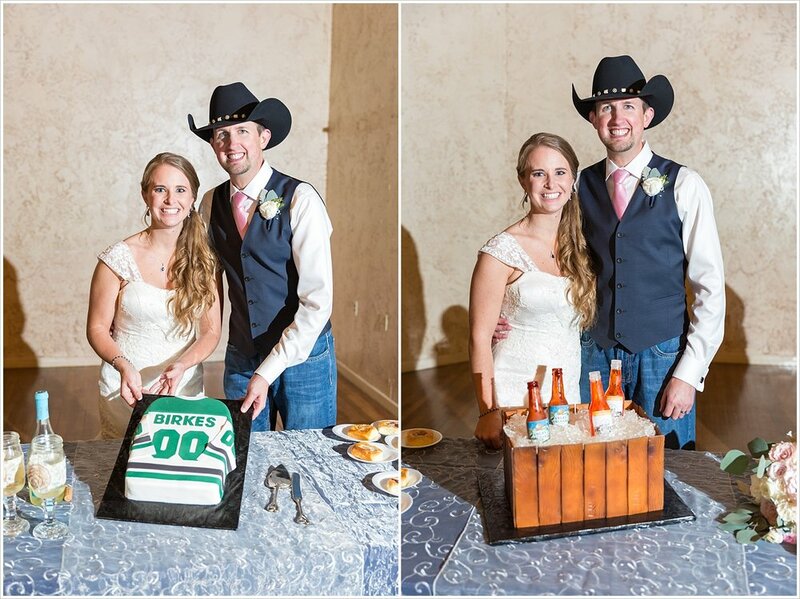 Brian and Kendra had a second chance to cut into a gorgeous wedding cake, made by The Cake Lady - Veronica Gloeckner, as well as not one but two amazing groom’s cakes by the talented All Sugard’ Up. 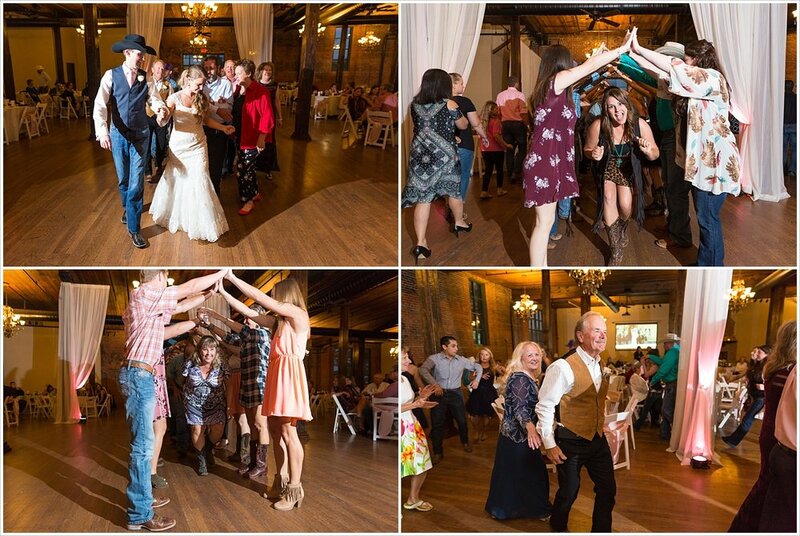 There was two-stepping and line dancing all night, endless margaritas at the bar, and in honor of Brian’s family’s Czech heritage, kolaches were served and everyone joined in on a fun Grand March around the ballroom. It was the perfect central Texas reception, y'all! We cannot say enough how much fun and what an honor it was to walk this journey with you guys! Thank you for the experiences on the track and the farm, and thanks for being friends. Your reception was beautiful and Texas and perfectly y'all, and we hope y'all enjoy these images for decades to come. We pray you have a long, happy marriage filled with laughter, music and dancing! 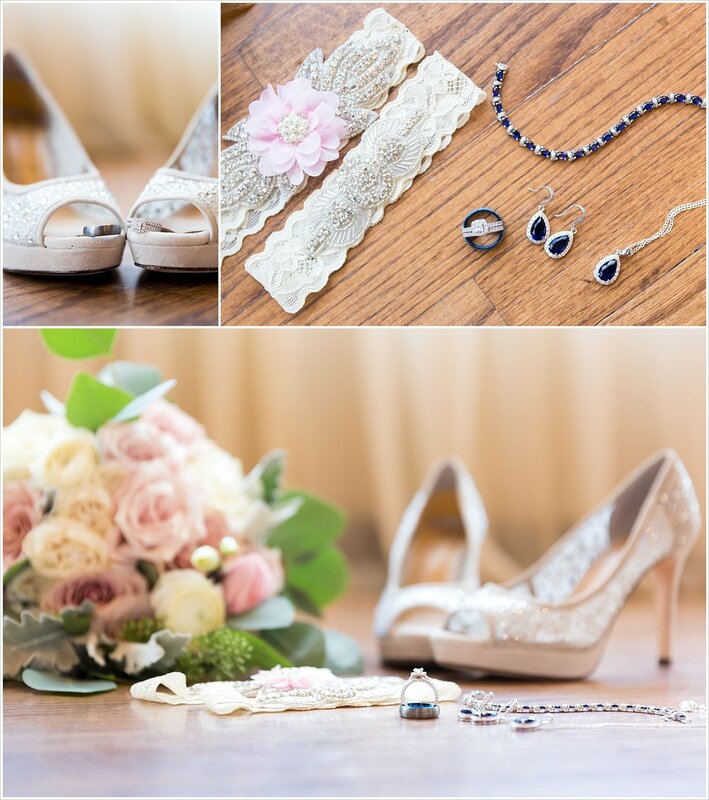 See more of our J&M Wedding Stories on the blog! Let me tell you about this girl right here. Stormy was my (Melaina) roommate my final year of college, and though that year was a stressful haze of 18 hours of classes a semester and being way over-committed, I have some super fun memories with her. Like how Stormy sewed individual slip covers for every cushion on our ugly old couch to make our space more beautiful. How she let me draw her portrait for one of my theater class assignments and didn't laugh in my face when it looked like a 2nd grader had drawn her picture. And I will forever be grateful to her for introducing me to all six glorious hours of the BBC's Pride and Prejudice with Mr. Colin Firth. Over the years since college we've seen each other occasionally but mostly remained connected through social media. Then one day we received an email from Stormy, asking if we'd be interested in shooting her wedding to her love, Trevor. Trevor and Stormy's wedding was beautiful and fun and so them. They were married in the breath-taking Catholic church they had attended as children in their hometown of Sweet Home, Texas. For the first half of their reception, they honored their Czech roots with trays and trays of kolaches and a polka band (A POLKA BAND!). And they danced the night away with their friends before driving off to their new life together. Congratulations once again, Mr. and Mrs. Seekamp. Thank you so much for the honor of telling this chapter of your love story. It was a blast!